I work with 2nd - 5th graders. Awesome, but fulltime to keep it going, avoiding the tech issues. Old Windows 7 flaky laptops, but getting it to work. Do you use the Robot Mesh “mimics” in their “Hour of Code” curriculum? I don’t believe they do. I’ll ask. I believe this is the planned next step at the moment. They’ve been using spheros / ipads etc, and i think the idea is to move into Chromebook / VEX programming. It’s less a class and more a pre school club which has grown over the years. So it gives these eager kids an introduction to coding and robotics. I just bookmarked the mimics page though. OK. I’m mostly RMS, Modkit and RobotC with Vex. 1st & 2nd Grade has Wedo Lego. Any other specific help, you can message me. If I can’t figure it out, at least it will be interesting, and perhaps I will know where to go look/ask. Nothing like a good challenge. If the user’s program (Flowol, Blockly or Python) includes the Joystick Controller, then the program is compiled and downloaded in such a way that requires the controller to be connected (either tethered with the wire, or via the radio). 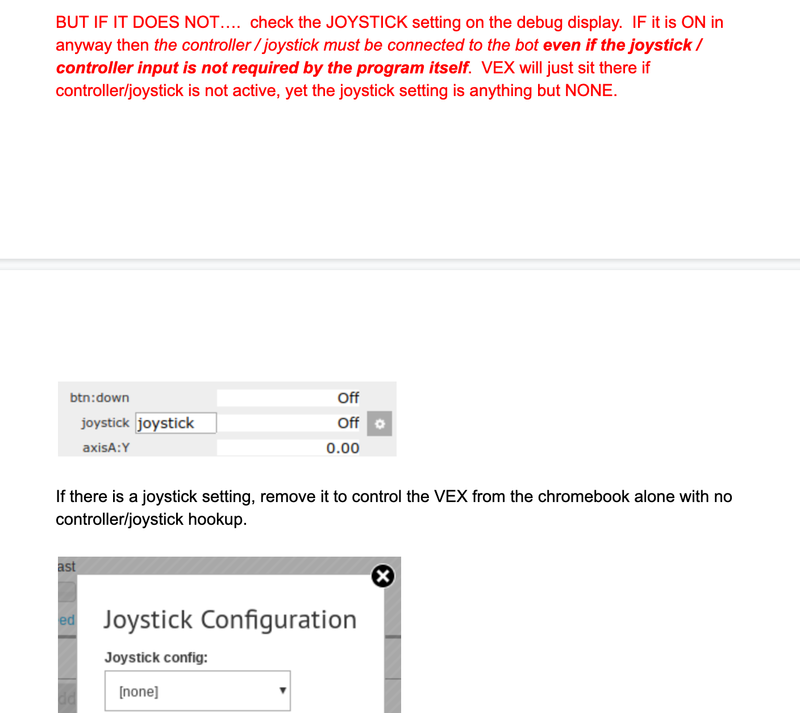 If you start the program and the controller is not connected then VEXos waits for the controller before starting the user program. If you’re writing a user program which doesn’t use the joystick controller (for example for a Programming Skills Match), then make sure not to configure the controller in the right-panel. Thank you for your feedback here. We’ll look into ways of making it more obvious what’s going on. I think we encountered the issue we did because when we did [detect sensors] the joystick was detected, if that makes sense, but we had no joystick dependency in our blockly code. We simply instructed the bot to drive forwards as a way of testing the chromebook / comms / brain setup. So we were confused when we could see the program compiling and downloading to the VEX and it just sitting there. It was by trial and error that i went thru the settingsn, moved joystick to none and it worked. Then we switched it back and it didnt work again. That was when we figured out the connection. Something a little more obvious would help, but of course we are wise to it now and have documented it for our teams! Modkit gives the same response, Program Name with otherwise blank screen. RobotC Graphical has a different paradigm, the rest of my post refers to it. Selecting “TeleOp Pgms” on the Brain without a Controller puts a “Controller Required” message on the LCD. Having two warning methods seem good. But here neither specifically aims you toward the fix. Never liked the “Controller Mode” toggle being in a separate place from the “Motor and Sensor Setup”. People miss that alot, get it wrong. And let us not start on the “Motor and Sensor Setup” itself. Took awhile, I can use it, but it reminds me of DOS. Also, I believe the “Controller Mode” is not saved with the program the way the “Motor and Sensor Setup” is, but is saved in the application state, so leads to confusion when opening programs written in the other mode. Anyone else, did I get this all correct?